If you’re at your desk all day and having trouble keeping up with the Tweets from your peeps, this Outlook plug-in from TechHit may be just what you need to manage your Twitter feed. It’s free, but only works with Outlook (not Express) on systems running Windows XP or Vista. 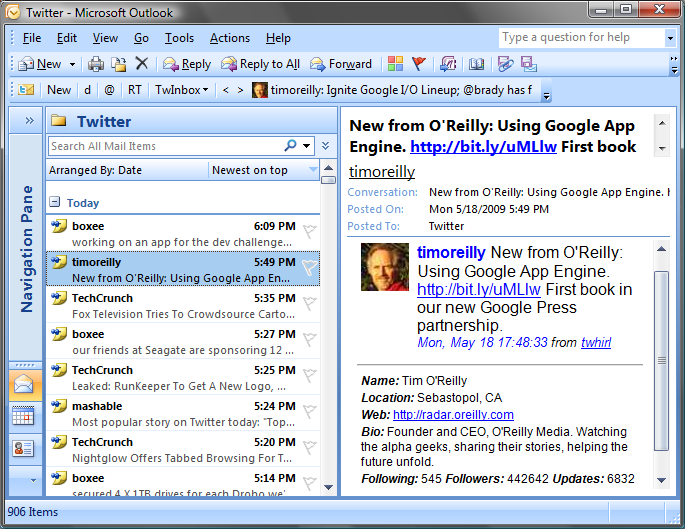 “TwinBox” brings the full Outlook client experience to Twitter. Just as you can organize your emails by folders, colors and status you can now do the same for your Twitter In-Box. Create rules based on senders, subjects or keywords to automatically sort your incoming Tweets. Quickly find a Tweet using the Outlook search functions. One great feature is that you set an age-limit for your Tweets so that anything past its expiration date is a removed. But not to worry, you can always recover a deleted Tweet provided you also use the AutoArchive feature. For you high-volume Tweeters, you can display graphs and statistical analysis tracking for your Twitter usage. As if you weren’t wasting enough time already! But at least now you know exactly who, where and when your day disappeared to.